You can hunt turkeys in the spring and in the fall. You always need a permit if you are going to hunt turkeys. The spring and fall permits, however, are different. The spring permit allows you to hunt in a specific area during one of the 5-day turkey hunting periods. In the fall, your permit will enable you to hunt any day during the season, as long as it is within the zone listed on the permit. 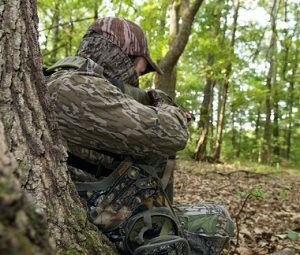 Once you have obtained your turkey hunting permit, there are a number of things you can do to have a successful outing. Be prepared to practice patience. Turkey hunting takes a lot of patience. Spring turkey hunting involves less patience, as you make hen turkey sounds to try to get a gobbler to come to you. Turkeys do not mate in the fall, though, so you will have to patiently engage in stand hunting. Stand hunting involves finding a spot and then waiting for the turkey to come to you. Since you will at some point be hunting turkeys in the spring, you must become familiar with the several devices used to make a turkey sound. There are two main types. One is called a friction call, which is produced by rubbing two surfaces together. The other is a mouth call. This occurs when the air is either inhaled or exhaled. The third type of caller, a shaker, creates a “gobble” noise when you shake it in a rapid motion. Regardless of which type of call you will be using, you must practice the call diligently. You will also learn a lot by listening to the turkeys themselves. They are the best examples to follow. Listen to live turkeys or a calling recording. You can also get help by contacting an experienced turkey hunter. Turkeys are capable of making more than two dozen different calls. Most hunters, however, can only notice about 10. Their sounds include the yelp, the cluck, the purr, the cackle, and the most familiar sound of them all, the gobble. Make yourself familiar with each of these turkey calls. The most important thing you will do to make sure a pleasurable turkey hunting experience is to practice safety. Turkey hunting, as with all forms of hunting, poses a threat to those who do not use caution and wisdom in the field. Use gobble calls only when you are locating a tom. Do not use it to attract one. This will cause another hunter to think that you are a turkey. You run the risk of being shot if this happens. Keep your hands and head camouflaged when you make turkey calls. Treat each and every gun as if it is loaded. Always point the muzzle in a safe direction, away from others. Be 100% sure of your target. Following these rules and guidelines will allow you to have a successful turkey hunting season, be it spring or fall. As with all forms of hunting, safety is always your highest priority. Keep this in mind, and you are ready for the upcoming season. Have as much fun as you can while practicing as much safety as you can.